Fig. 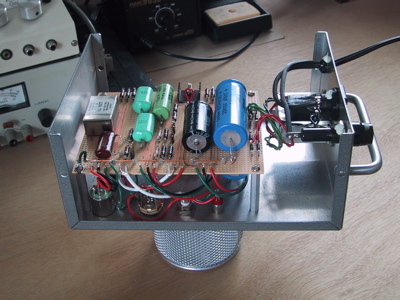 1 Vacuum Tube DI for Musical Instruments. Active electronics onboard the instrument. This is optimal for the case of an instrument which can be modified without harming its utility and value. Requires that DC power be brought into the instrument, either through special cabling or an internal battery. Should not be done to collectible instruments if they didn't come with onboard electronics. Conveniently implemented as a field effect transistor (FET) or bipolar junction transistor (BJT) follower, or perhaps an amplifier with modest gain. Can drive any impedance input, while eliminating stray capacitance in cabling and connectors. First made popular by Alembic in the late '60s and Music Man in the '70s. Active electronics inside the cable. 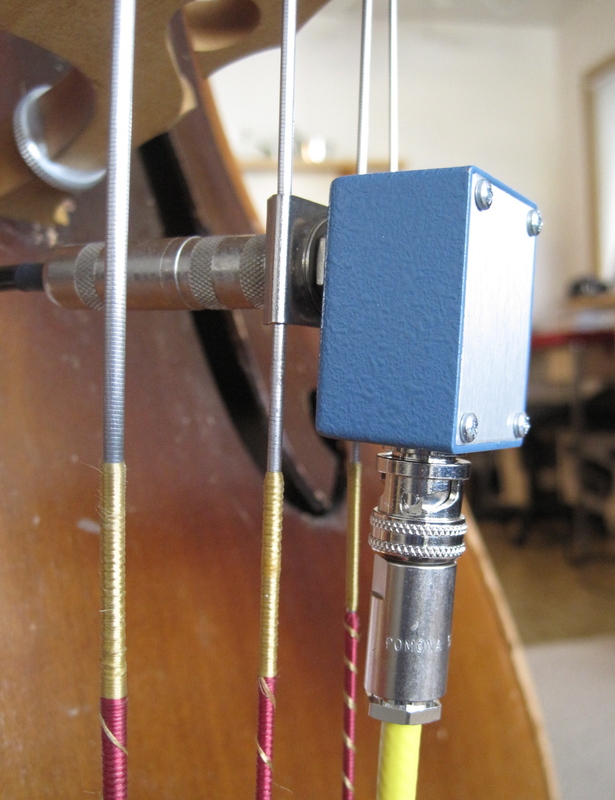 Next best solution, allows a simple follower or amplifier to be placed very close to the instrument, for instance inside the plug backshell at the instrument end of the cable. Can drive any impedance input, while eliminating stray capacitance except for one plug and one jack. The instrument itself is unmodified. I have previously developed solutions of this type, which I call Active Plug technology. So-called "Active Cable" solutions are also commercially available. 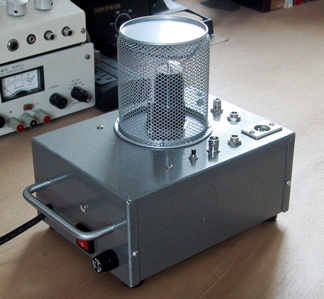 High input impedance amplifier. This is usually the least desirable solution, as it takes no account of cable capacitance. For some artists, of course, the cable is part of their sound and shouldn't be messed with. But in applications where the desired signal is the voltage source inside the pickup, this just won't do. Unless, that is, a way can be found to cancel out the cable capacitance. The remainder of this page describes a solution I've developed which does just that. Note to search engines: Please index this page under both "vacuum tube" and "thermionic valve" DI or direct interface, since either name could be used. Coaxial cable is commonly available and universally used for musical instrument pickups, often with 1/4" phone plugs on each end. But did you know that triaxial cable is also available? Like coaxial cable, the triaxial form has an inner center conductor and an outer braided shield, but it also has an inner braided shield which is electrically isolated from both the center conductor and the outer shield. What you do with the inner shield is up to you, but in simple applications you could connect it to the outer shield resulting in a conventional coaxial cable, or you could use it to carry the pickup ground separate from earth ground to overcome ground loops. But what I have done is to drive the inner shield with a signal which is nearly identical in phase and amplitude to the pickup signal. So the center conductor and the inner shield are carrying the same signal and have no potential difference between them. The result of this is that no charge is stored in the inner dielectric, and the capacitance seen by the center conductor is essentially zero. When used with triaxial plugs and jacks meant to go with this type of cable, stray capacitance due to cable and connectors can be made arbitrarily small. This may sound like you are getting something for nothing, but what is actually happening is that the pickup signal on the center conductor is amplified, not in voltage but in current, before it is used to charge the outer dielectric, between inner and outer shields. This represents a very large capacitance, much larger than the capacitance from center conductor to inner shield, but the load it represents is now on the preamp output, not the pickup, and the pickup signal is then faithfully reproduced. Fig. 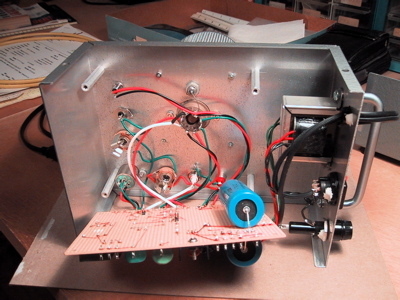 2 Inside View of Vacuum Tube DI. In this configuration the inner shield is driven from the amplifier end, with the instrument end left unterminated. There are limits however on how far you can take this technology. Specifically, the pickup signal on the center conductor takes finite time to reach the far end of the cable, and the signal applied to the driven inner shield similarly takes finite time to return to the instrument end of the cable. In DC or slowly changing conditions, this doesn't matter. But as frequency increases you'll eventually reach an upper limit, above which the center conductor and inner shield can no longer be thought of as having the same potential at all times. Consider the 60" cable that I used for this prototype. In metric units the cable length is about 1.5 m, or 3.0 m round-trip. Propogation speed in Belden #9222 is specified as 66% of speed of light, or about 2 × 108 m/sec. When the round trip, which takes about 15 nsec., allows more than 90° of phase shift, which occurs above 16 MHz, then it is unlikely that input capacitance will be cancelled effectively. Luckily this is far above the audio range, which explains why the prototype was a success. We could even increase cable length if needed, and still remain well below the cutoff frequency. In this scheme there are no active electronics required inside the instrument, and no active electronics in the cable. All active circuit elements are in the preamp or direct interface (DI) at the other end of the cable. So collectible instruments need not be modified and power is not carried in the cable, which means it can be connected and disconnected while the circuit is live. The active circuit needed for this application is a simple follower with high input impedance (1 MΩ or more), low output impedance (1 kΩ or less), and unity gain (+0.0/-0.1 dB) with modest phase shift at all frequencies of interest (20...20kHz). One can imagine a variety of circuits that meet these requirements, but I chose to implement a cascode follower, using a 6SL7GT high-mu twin triode vacuum tube. V1B operates as a simple cathode follower, but instead of a resistive cathode load, V1A is used as an active load, driven by a signal picked off of the upper triode's plate via C2. Both triodes are self-biased, leaving the output level midway between ground and the positive supply. The common heater is held at fixed bias with respect to the cathodes, so the maximum cathode-to-heater voltage is not exceeded. The cascode follower topology used here delivers broad bandwidth and good dynamic range, while meeting all of our other requirements. I found this circuit in an application note from Jensen Transformers, listed below in the References. On my prototype a variety of outputs are provided including 1/4", RCA, and XLR (via a Lundahl microphone transformer). Note that these outputs are all effectively in parallel with the driven shield, thus the need for low output impedance in the follower. Safety note: This prototype, and any similar vacuum tube design, contains lethal voltages inside whenever power is turned on. These voltages can also remain in the filter capacitors for some time after power is turned off. R12 and R13 in the schematic diagram of Fig. 3 are intended as a drainage path for the filter capacitors, and should always be in place when this circuit is used. You are responsible for being sure that no high voltages are exposed when the covers are in place, and that all necessary safety procedures are used when the covers are off. Fig. 3 Schematic diagram of Vacuum Tube DI. The Lundahl LL1577 transformer I chose for the mic level output happens to have a split winding, which could be wired in parallel instead of in series to obtain a 6 dB lower output level if desired. I generally set up my DI boxes to produce an output level which is comparable to the signal from a Shure SM57 or SM58 microphone placed near the same instrument, which minimizes confusion when setting levels in live situations. The split winding could also be used	to pick off phantom power, but this circuit draws far more than the approximately 100 mW (10 V × 10 mA) available from a phantom supply. Actual DC voltages at the tube socket are listed in Table 1 below. All measurements were taken with a digital multi-meter (DMM) having 10 MΩ input resistance to ground, with nominal line voltage and no input signal. Note that the measurement of pin 4, triode B's grid, is not meaningful due to loading from the DMM. A more meaningful measurement would be the voltage across R4, which should be essentially zero. Table 1. 6SL7GT Pin Voltages. Due to the high impedances present at the input, I had to pay special attention to a number of details in the prototype to minimize hum and buzz. Here is a short list of sources, both magnetic and electric, that could introduce 60Hz and harmonics into the circuit. The 6.3 Vac secondary of the power transformer could be connected directly to the heater pins on the vacuum tube, but that would bring 60 Hz right inside the tube! I chose to rectify the heater supply with a bridge made up of four 1N4002 diodes, and filter it with a 2200 uF electrolytic capacitor. Some 120 Hz ripple still reaches the heater, which could be further reduced by using a regulated 6.3 Vdc supply. High impedances will be present both above and below the tube socket, so proper shielding must be in place and well grounded both above and below. As shown in the snapshots, I've mounted a wire screen pencil holder upside down over the tube, which protects it mechanically as well as electrically. Below the socket I've got the power supply area walled off from the rest of the circuit by placing two large high voltage electrolytic capacitors in the way. Their cases are grounded and represent good shields against line-of-sight interference. All exposed metal is grounded, both inside and outside the chassis. The mic-level output transformer will pick up 60 Hz hum from any nearby magnetic field, including that of the power transformer. I minimized this by placing the power and mic transformers at opposite ends of the chassis, and by aligning their respective axes to obtain a null in hum pickup. This null is quite sharp, so you'll have to position the transformers very carefully to obtain a minimum. Ripple on the high voltage plate supply can creep into the output, so I've installed oversize filter capacitors C5 and C6 in a π configuration with R11, as shown in Fig. 3, the schematic diagram. Connections to the input jack and the grid of V1B are especially high impedance, so I made them using coaxial cable with the shield driven from the cathode of V1B. Triaxial cable isn't needed in this case, because you're already inside the (grounded) chassis. At the instrument end of the triaxial cable I used a small adapter box with a Switchcraft SilentPlug 1/4" plug with a grounding switch at the input, and a 3-lug triaxial connector at the output. The grounding switch is engaged whenever you remove the plug from the instrument. I also found that I could disconnect the triaxial plugs at either end of the cable without causing a huge amount of noise. I've written elsewhere about how ordinary balanced line mic cable is susceptible to localized sources of 60 Hz hum, but did not use Star Quad techniques in this prototype. 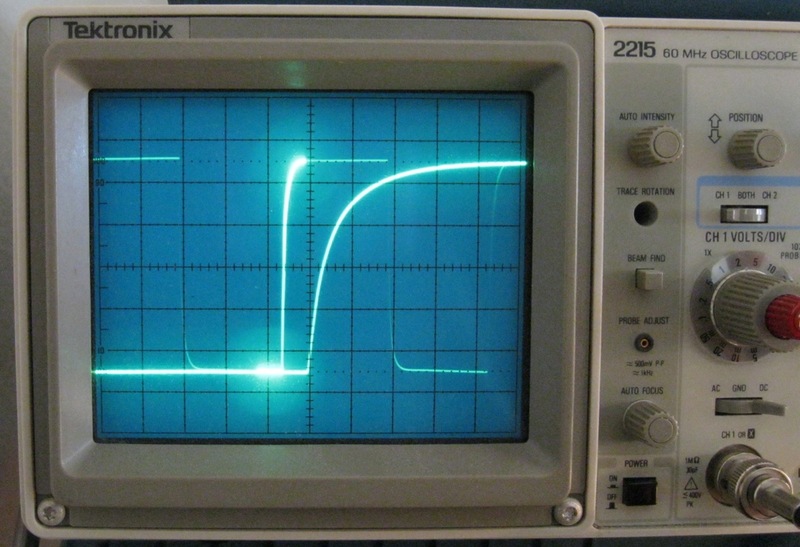 With all this talk about high impedance, you're probably wondering just how high was it? With the parts values shown in Fig. 3, I measured 40 pF in parallel with 5 MΩ using an Agilent bench-top LCR meter at 1 kHz, connected to a 1/4" phone jack at the instrument end of the triaxial cable. So this represents the total load on the pickups and circuitry internal to the instrument. R4 and R7 are effectively in parallel with the input, but both are returned to the cathode of V1B which multiplies their impedance by a substantial factor. The 40 pF total includes a variety of contributions which are estimated in the following table. Table 2. Contributions to Input Capacitance. Testing of the prototype has been fairly uneventful, working both indoors and outdoors while recording and in live performances. Signal quality and level were fine with both our small Mackie 16-input board, and with big rented concert rigs. The Belden #9222 triaxial cable (see Fig. 4) is a bit stiffer than conventional guitar cable, but was easy to work with and showed no sensitivity to mechanical vibration or noise. The triaxial connectors themselves were reliable and noise-free over a wide range of temperatures and ambient conditions. Time will tell if they are sufficiently road-worthy to consider for touring use. As expected, the driven shield methodology makes the cable disappear from the signal. Before settling on the modern TungSol 6SL7GT tube, I also tried a new old stock (NOS) 6SU7GTY but found it to be microphonic. You can directly plug several different tubes into the prototype without modification, including 6SL7GT, 6SU7GTY, 6188, and 6SU7WGT. These all have a 6.3 volt heater at 300 mA. One might also consider the 6SN7 which needs 600 mA of heater current, or the 12SL7GT which requires 12.6 Vdc of heater voltage; both of these changes would mean a different power transformer and perhaps other changes as well. Some web sites mention the RCA 5691 as a substitute for the 6SL7GT, but it also needs 600 mA of heater current, again requiring a bigger power transformer. Fig. 4 Triaxial Cable Connected to Bridge Pickup. The biggest surprise for me in developing this prototype was that there were no surprises. Triaxial cable used to connect a musical instrument works just as expected, with no particular problems or difficulty. It's been available, and used in niche markets having nothing to do with music, for many years, so I can't imagine why no one has tried it on musical instruments before. I'll certainly be using and promoting it wherever I go. If you have tried triaxial cable, or would like to try it, feel free to contact me at the email address shown in the graphic at the bottom of this page. I would be very pleased if triaxial cable found a larger audience among musicians and technicians. As shown in Fig. 5, most components in the prototype, other than the vacuum tube and connectors, were supported on perf clips on a large piece of perf board. Enameled magnet wire was used to connect the perf clips together as needed. Due to the large voltages present in the circuit, I was careful to avoid having wires touch when crossing over one another, by stitching them through the holes in the perf board so they could pass by on opposite sides. Kind of like a double-sided circuit board, but using a wrap and burn technique. Initially I had planned on using point-to-point wiring with terminal strips, but quickly realized that there were too many parts for that. Fig. 5 Wiring of Vacuum Tube DI. 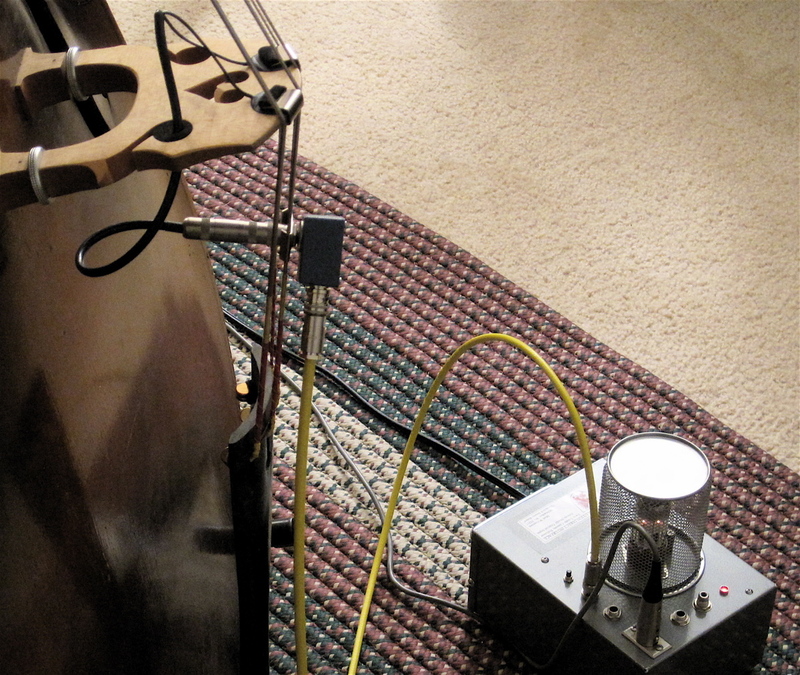 After playing the Tube DI enough to decide that I liked the sound, I made some bench measurements to be sure I hadn't overlooked anything. Headroom and frequency response are outstanding. Large amplitude signals are slew rate limited at high frequency (above say 10 kHz), presumably by the need to charge the substantial capacitance of the triaxial cable's outer dielectric. Maximum output at low frequency (below say 40 Hz) is limited by clipping, perhaps due to the time constant defined by C2 and R2 making active load V1A less effective in that range. Overall performance is exemplary, so I feel no need to tweak anything at this time. All measurements were made using a 1.5 m triaxial input cable with driven shield, and a single-ended coaxial output cable of similar length. Measured results could vary somewhat depending on cable length. 10 Vac sine waves and 5 Vdc square waves were obtained from a modified Heathkit IG-18 audio generator. Total harmonic distortion (THD) was measured with a home-brew filter set described here. Rise time was measured on a Tektronix 2215 oscilloscope with delayed sweep. Fig. 6 Rise Time Measurement at 10 kHz. Following in Table 4 is a fairly complete list of parts needed to duplicate my prototype. Details are given where known, which is more likely for recent purchases. Where details are missing, that just means I had parts on hand of uncertain origin. The triaxial cable and connectors may seem exotic, but they were in stock at Mouser. The high price may be due to tight tolerances in the connectors, or perhaps due to modest demand. One can also make their own triaxial cables to custom length, using Pomona connectors and Belden #9222 triaxial cable. Other connectors with three (or more) circuits could be used, but the 3-lug connectors specified are clearly meant for triaxial cable, so there is no risk of getting your cables mixed up. Note well: You can also obtain 2-lug connectors which are designed for triaxial service, but I would urge you to avoid the 2-lug variety. There is a possibility that they could be accidentally mated with non-triaxial BNC connectors which also have 2 lugs, risking permanent damage to either or both connectors! Fig. 7 Triaxial to Phone Plug Adapter Box. Data sheet for 6SL7GT High-Mu Twin Triode Vacuum Tube, General Electric bulletin ET-T1450. Schematic diagram for Push-Pull Vacuum Tube Cascode Follower, Jensen Transformers application note AS021. Schematic diagram for High Voltage Power Supply, using TubeDepot "Button" transformer (open the data sheet). Eagle Cad design software was used to create the schematic diagram shown above. Has lots of features and is fully cross-platform capable. "Configuring Your Data Acquisition or Test and Measurement System for Maximum Noise Immunity", White Paper #5051, by Dale Cigoy, Keithley Instruments, Inc.
"Labs' Demands for Greater Measurement Flexibility Require Cabling Systems Capable of Accommodating Multiple Measurement Types", White Paper #3023, by Wayne Goeke, Keithley Instruments, Inc.
Commercial products with capacitance-cancelling technology: ZeroCap and VariCap Cabling for musical instruments. I am placing the circuit ideas and schematic diagram presented on this page in the	public domain, for the benefit of musicians and technicians. Please remember that only you can determine if these ideas are suitable for your application. Feel free to post a link to this page on your site, but please don't copy my content. This page should be available at this URL for the foreseeable future. I claim a trademark interest in the	names "Williamsonic" and "www.williamsonic.com".